Sippy cups are no longer a want around my house...they are a NEED. My children use them exclusively as I don't trust either of them with adult glasses yet. I have yet my three year old use a regular glass before but it makes me really nervous to see her doing it so I stick with her sippy cups. My favorite ones are the no-leak brands. They are WONDERFUL...especially if the child likes to wander around the house with cup in hand. I find cups all over my house. The fact that they do not drip and spill is a wonderful feature that any mom is bound to love. Yes, I find our sippy cups in the oddest of places. Yesterday, my son threw one in the toilet! YUCK!!! Let me tell you, that one was sanitized and sanitized again! I am sure many of you have heard of Tommee Tippee before and if you haven't, then you are in for a real treat today! Tommee Tippee is a wonderful resource for parents whether you are looking for advice, mother and baby products or just a place to find reviews on their products. Tommee Tippee is found throughout the world and to me, this makes them a very well-known and reputable company. I am also glad that they (being the resource that they are) are available to parents everywhere. Tommee Tippee is also really well known for their breastfeeding supplies and pumps and I am a huge fan of anything breastfeeding-related. One thing that I just LOVE about these cups is that they have an insulated base so chilled drinks will stay cold longer. Also, they are leak-proof and have a removable leak-proof piece for easy washing. I am all for products that are easy to clean!! Nice to know as well, you can put these in the microwave and dishwasher. My daughter is really enjoying her cup and thinks she is a real princess every time she sees the picture on it. That makes ME happy! 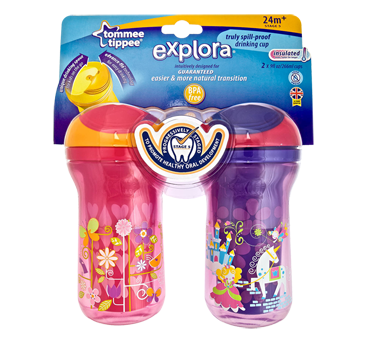 So, in my opinion...Tommee Tippee's Explora Truly Spill Proof Cups are wonderful. I love the fact that they come in a two-pack so if you have more than one child, you have one for each. I also love the spill-proof factor...that is priceless!!! If you are looking for a nice cup for your child for on the go or just for use around the house, then I would definitely check out these Stage 5 cups from Tommee Tippee! Wonderful company, beautiful product! Visit Tommee Tippee and let me know which product is your favorite. :) You do not have to be a blogger to enter, but you must have a valid email where you can be reached should you win. If you do not leave an email address, it must be where I can easily find it. This giveaway is open to US residents and will end 1/3 at 11:59 pm EST. The winner will be chosen using random.org and will be notified by email. The winner will have 48 hours to respond, or another winner will be selected. 1. "Like" Tommee Tippee on Facebook. 2 entries, so 2 comments. 2. Follow Tommee Tippee on Twitter. 1 entry. 6. Vote for me on Picket Fence Blogs. 1 entry per day, so 1 comment per day. 7. Leave a comment on any review only post. 1 entry per post commented on..tell me the name of the post on which you commented. Unlimited. 8. Add this giveaway to a linky. Leave me the link to the linky list it was added to. 1 entry per linky. 9. Blog about this giveaway. Leave me a DIRECT link to your post. 5 entries, so 5 comments. Disclaimer: I received no monetary compensation for this post. 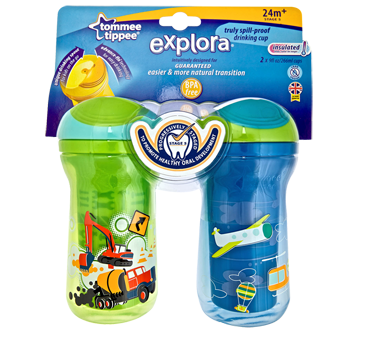 I did receive a set of Tommee Tippee Explora Truly Spill Proof Cups for review purposes. All quotes and stock photos are from the Tommee Tippee website and email. Prize is being mailed by the sponsor. All thoughts and opinions are 100% mine. I would love to have the pacifiers to try with my daughter too! I like the closer to nature ® clear shield pacifier 0-6m x2 - pink. the Truly Spill Proof cup for my grandson! I like the 4 pack Explora Food Pots. I love their monitors with the sensor pads! I like the explora® food pots = how cute! I'd love to have the closer to nature ® Manual Breast Pump! the closer to nature ® DECT Digital Sensor Pad Monitor would be my favorite! I have learned the explora Li'l sippee spill proof trainer cup isn't so spill proof once your child figures out they can stick their finger in and let the liquid flow out! But we really love the explora truly spill proof trainer cup, that really is spill proof! I like the explora® Section plates x2 Blue. I would love to try their closer to nature feeding bottles! I really like closer to nature ® DECT Digital Sensor Pad Monitor from the Tommee Tippee Website. I like the explora food pots in green and blue. We have had nothing but GREAT luck with the Closer to Nature bottles when our little guy was in daycare! The teachers all loved them too. They are my fav TT product! My favorite is their sterilizer! I like the explora ® Li'l sippee spill proof trainer cup. My favorite item is the explora truly spill proof water bottle in aqua / blue. I Like" Tommee Tippee on Facebook.